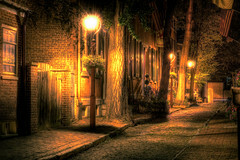 This incredible photograph of Society Hill at night, perfectly conveys the ambience of the neighborhood. This photo is of a small street between Spruce and Pine Streets. To fully appreciate the photo, just click directly on it, to enlarge it. The downtown Philadelphia neighborhood of Society Hill permits the visitor to feel transported back to the 18th century, more so than any other neighborhood in the city – or in America. It is easy to imagine yourself in colonial times, discussing the latest intrigue in the American Revolution – or a few years later, discussing the Presidencies of George Washington or John Adams, both of whom served their terms of office here. This page is still under construction. Please be patient, and check back for more content. The name of Society Hill dates all the way back to the 17th century. In 1682, William Penn - the founder of the colony of Pennsylvania and the city of Philadelphia - and his surveyor, Thomas Holme, laid out a planned grid for the new "greene countrie towne", as they put it. Right from the beginning, when Pennsylvania was still being planned in England, Penn granted some prime real estate - to the Free Society of Traders, in London. The Free Society of Traders were the 17th-century equivalent of 21st-century venture capitalists. Contemporary Society Hill is defined, officially, as everything south of Walnut Street, down to what is known today as Lombard Street, and from Front to what is now 8th Street. However, the original grant of land to the Society was far larger - 400 acres, running from the Delaware all the way to the Schuylkill River. It was largely undeveloped, forested country, although there were a handful of Welsh and Swedish settlers. The Society proudly flew its flag from its trading house, the nearby Dock Creek hill, and as a result, the neighborhood became known as "the Society's hill", and eventually, "Society Hill". Undoubtedly, the Society's officers anticipated that they would be prime movers and shakers in the new colony, ranking just beneath the proprietor, Penn, himself. And this belief was understandable, as they were granted a stunning array of legal privileges, in addition to the sizable grant of land in the heart of the new city. The Society was given the "manor of Frank" - what eventually would become the borough of Frankford, north of Center City - as well as the right to elect three representatives to the General Assembly. The incorporation documents had been drawn up in London, back in March 1682, and its initial meeting and election of officers was there. But all subsequent meetings were in Philadelphia. In April 1682, the sum of 4500 British pounds - Philadelphia's first investment capital - were raised for the venture - the rough equivalent of 610,000 British pounds in 2008, or according to Measuring Worth's retail price index, or about $1.13 million in 2008 dollars. The Society also organized its internal politics. If you bought 50 pounds worth of stock, you received one vote; 100 pounds, two votes; 300 pounds or more, three votes. However, there was an important proviso, designed to reward those most committed to the success of Pennsylvania. You could not cast more than one vote, unless you actually lived in the new colony, or you were the owner of 1,000 or more inhabited acres there. On May 5, at a meeting attended by all large purchasers of Pennsylvania lands in London, adopted by-laws, with Penn's consent. The provisions virtually gave the Society the run of the new colony, as one stipulated that its charter could only be changed by the Governor, with a six/sevenths majority of the General Assembly. One reason for the latitude was the fact that Penn's oldest son, as well as many of his friends, were investors in the Society, and Penn recognized that he needed their capital to make the colony a success. Ironically, the Society's treasurer James Claypoole - a descendant of whom likely married Betsy Ross a century later - anticipated the Society's enduring prominence, for over three centuries. He wrote in a letter dated July 14, 1682 - "We could very well employ 20,000 pounds [that is, four times the original investment]... It may come to be a famous company." Of course, it did, but not for the reasons Claypoole anticipated. The investors had banked on a large trade with the Native Americans throughout North America, even sending a missive on June 19, 1682 from London to the "Emperour of Canada", pitching him on doing business. However, the Society was in for many surprises. Initially, it discovered that despite the deal that had been struck in London, the Pennsylvania General Assembly had made no provisions for the three members the Society had been guaranteed to represent its interest. The Assembly met for the first time on March 10, 1683; on March 12, Nicholas More - the Society's president - was called to it to account for charges that he had said in a tavern that the Assembly had breached the charter by its failure to provide those seats, and should be "impeached for treason" - which he denied. Once they arrived, industries were set up in Society Hill. In 1683, it constructed a tannery and grist mill, as well as a saw-mill and glass factory the following year. As for the rest of its capital, it went into land purchases and investment in English goods, bound for America, for trade. However, the venture failed completely. Within a few years, it had effectively collapsed, and the Society survived only as a landholder. The disintegration of the Society did not mean the end of Society Hill, though. Over the decades, the land's value only appreciated, as Philadelphia boomed and achieved economic prominence. Due to its close proximity to Independence Square and the other government buildings, it became home to the city's elite, and well as many federal officials during Philadelphia's time as the national capital. Due to its high value, the land was sold, resold, and subdivided many times, which is why it has so many alleys, nooks, and intimate streets - one of the major reasons for its 21st-century cobblestoned charm. Society Hill gradually declined, however, during Victorian times. The prestigious address shifted west along with Philadelphia commerce, when the construction of City Hall and the railroads shifted the commercial center westward to Broad Street, Rittenhouse Square, and the like. As the metropolitan area burgeoned, wealthy folk also migrated to Chestnut Hill and the Main Line suburbs, newly accessible by rail service. This decline began around the Civil War and continued until the immediate aftermath of World War II, in the middle of the 20th century. However, Society Hill was lucky in several respects. One was that for the most part, the 18th and 19th century housing stock was not demolished, as often happened in other cities to make way for modern buildings. At the time of the launch of the effort to preserve Society Hill, over 600 structures from those centuries still existed, more than in any other American city. Another was that the area never deteriorated into slums. Economic activity remained. It became more blue-collar, as the Dock Street produce market - located near the Merchant's Exchange - processed food entering the city from its increasingly busy port, and dock workers found housing there. The effort to save Society Hill was launched by Edmund Bacon, the Executive Director of the City Planning Commission (and incidentally, the father of actor Kevin Bacon). Unlike other cities, which were razing what they perceived as obsolete neighborhoods and rebuilding from scratch, Bacon had the vision to see that historic Society Hill could and should be preserved. He formulated a Master Plan, a complex blueprint for revival and restoration of the neighborhood. One key improvement was getting rid of the Dock Street produce market, relocating it to industrial South Philadelphia. This inappropriate commercial space could then be restored to either residential housing or commercial space better suited to the neighborhood. An army of City Planning and Redevelopment Authority staff was deployed, which surveyed every building in Society Hill, to evaluate which houses could or should be saved, and which could not. They formulated standards for saving existing structures, laid out regulations to govern what sort of new buildings could be built, and most significantly, permitted the Society Hill Towers, designed by I.M. Pei, to be constructed - which opened in 1964. Although there was substantial opposition to the modernist towers, they felt that they needed to create more residents in the neighborhood, and if only those both willing and financially able to live in a historic house were permitted to live in Society Hill, it endangered the success of the entire initiative. The Towers also permitted renters to try out living there, without making the full commitment to buy real estate, and this was another critical factor to success. Bacon's own touch were the creation of "greenways" - small pedestrian walkways connecting some of the historic sites, although regrettably, some historic structures had to be demolished to create them. Substantial credit also should be given to the architect Charles Peterson, a leader in the creation of Independence National Historical Park. Peterson criticized the decision to raze certain structures of historical value, and led a successful effort to preserve them from demolition. He also had successfully preserved a house in Society Hill; he was thus able to pass on advice and guidance to other individuals who wanted to do likewise. Society Hill's fortunes also benefited from the election of the reform mayor Richardson Dilworth in the 1960s, whose administration believed heavily in the wisdom of the project. As a result, the Old Philadelphia Development Corporation was created to oversee the restoration. The success of the restoration of Society Hill warranted national attention, as it was featured on the cover of Time magazine in the 1960s. And as a result, when Philadelphia welcomed the nation to Bicentennial observances in 1976, Society Hill had been returned to its former glory. There are three major upsides to a Society Hill walking tour, after hours. It's free, you don't have to keep track of when the various houses are open, and you can do it, 24 hours a day. In fact, given the heat and humidity of Philadelphia during the summer, it might actually be more enjoyable to do it then, as the summer sky in Philadelphia turns to night at dusk. The Powel House is the first stop on your tour. It is the best of the preserved 18th-century homes, and if you only have time to see one, this should be it. It is located at 244 South 3rd Street, just above Locust Street. It was constructed in 1765, and was the home of Samuel Powel, known as the "Patriot Mayor", as he was the last mayor of Philadelphia under British rule, and the first under the new American government. He and his wife, Elizabeth Willing Powel, were among the most important residents of the city. Powel led a remarkably colorful life, set amidst the backdrop of spectacular wealth, the trans-Atlantic world and political intrigues of the American Revolution. Samuel Powel was born in 1738. His grandfather, also a Samuel Powell (but with two "l"s) had arrived in the colony during the early days of settlement. He accumulated a fortune in the building industry, and by the time his grandson had turned 18, he was the heir to a large fortune. The younger Powel graduated from the University of Pennsylvania in 1759, and embarked on a grand tour of Europe, in imitation of the young British aristocrats of the time. However, his tour was more prolonged that most, as he was there for seven years. Ironically, Powel witnessed the coronation of King George III in London in 1765. While he was there, he converted from Quakerism to Anglicanism, he had an audience with Pope Clement XIII in Rome, had his portrait painted, and shipped crates of antiques back to Philadelphia. A merchant, Charles Stedman, had commissioned the house, but when he went out of business, Powel snapped it up. It was located next door to the house of Governor John Penn. If the walls could talk, they would have great stories to tell. When the British occupied the city, from September 1777 to June 1778, the Powels remained loyal to the American cause, while hosting the Earl of Carlisle, a British officer with whom they got along very well. Over the years, George and Martha Washington, John Adams, the Marquis de Lafayette, Benjamin Franklin, and Benjamin Rush were all entertained by the Powels. Powel died in the 1793 yellow fever epidemic that hit Philadelphia, and destroyed any chance of it remaining as the national capital. Several years later, his wife sold the house. It changed hands several times, and by the early 20th century, it was home to a import/export business specializing in Russian horse hair and bristles. The owners had sold off nearly everything to the Philadelphia Museum of Art and the Metropolitan Museum of Art in New York. In 1931, it was almost demolished in order to make room for a garage, but the Philadelphia Society for the Preservation of Landmarks obtained it and protected it. Powel House is operated by the Philadelphia Society for the Preservation of Landmarks, not Independence National Historical Park. Tours are available Thursday, Friday, and Saturday, 12 noon - 4 PM, and on Sunday, 1 - 4 PM. Some Saturday afternoons it may be closed, due to special events. The Physick House is located at 321 South 4th Street - that is, 4th Street between Spruce and Pine, at the intersection of 4th and Cypress Streets. It stands out as a free-standing home, in a city of rowhouses, and is the best example of Federal architecture remaining in Society Hill. Construction began in 1786, three years after the American Revolution ended. The Madeira wine merchant Henry Hill had originally commissioned the house, but its most prominent owner was the aptly named Dr. Philip Syng Physick, known to history as the "Father of American Surgery". Hill had made a fortune importing Madeira wine, a passion for the thirsty colonists - enough to finance a 32-room house of such splendor. Unfortunately, the house wasn't completed until 1788, and Hill only had a decade to enjoy his house, as he died of yellow fever in 1798. Then as now, Philadelphia was a leading center for medical education and practice - and Physick was extremely well-traveled and well-educated, both in Philadelphia and abroad. He graduated from the University of Pennsylvania, and followed it up as a medical apprentice to a top London surgeon, John Hunter. Physick completed his education with a medical degree in Edinburgh, Scotland, one of Europe's leading medical centers. Physick was born in 1768, but he didn't begin his residence, along with his seven children, at the Physick House until 1815, at age 47. He lived there for 22 years, until his death in 1837. In 1800, at age 32, Physick married Elizabeth Emlen, and had seven children with her. They divorced in 1815, at which point Physick moved into Hill's home. As mentioned above, Powel House is next door to the house once occupied by Governor John Penn, the grandson of William Penn, located at 242 South Third Street. Although it isn't open to the public, it's worth mentioning. Penn was the final colonial governor of Pennsylvania, under British rule. He took office in 1763, at the end of the French and Indian War, but presided over the colony, as the relationship between Britain and its colonies deteriorated over the years. After the American victory in the war, Penn retired from city life and constructed a villa in what was then the Philadelphia countryside - the Schuylkill River. He aptly named the architectural masterpiece Solitude, and ironically, it now remains on the grounds of the 42 beautifully-landscaped acres of the Philadelphia Zoo - the first zoo in America, chartered in 1859. It was also home to Benjamin Chew, a prominent Loyalist who was the last chief justice of Pennsylvania under British rule. After independence, when Philadelphia served as the national capital, the first two Spanish ambassadors to the new nation - Juan de Miralles and Francisco Rondon, resided in Penn's old home. Although it had been fully restored to its 18th-century appearance - regrettably, A Man Full of Trouble closed its doors to the public in the mid-1990s. But it's still worth seeing (and as noted, your nighttime tour has the benefit of not requiring the buildings to be open). Its unusual name is biblical in origin - it was inspired by Job 14:1, which reads - "Man that is born of woman is of few days, and full of trouble". In 1759-60, A Man Full of Trouble was constructed by Michael Sisk, out of red brick, on the banks of Dock Creek (which has subsequently been filled in). Its first owner was Joseph Beeks, who lacked a license to operate a tavern. In 1773, just before the American Revolution broke out, it was acquired by James Alexander, who had a tavern license. Alexander owned it for 16 years, through 1789. Licensed as an inn, as well as with a food and liquor license, A Man Full of Trouble - given its Front Street location - catered largely to mariners, who undoubtedly found even the small quarters of the tavern's attic, preferable to their cramped lives at sea. In 1796, a widow named Martha Smallwood bought the tavern, and attempted to elevate it to a higher level of ambience than a dockside haven, prior to her death in 1826, three decades later. After she died, the building was converted to other uses in the 19th century, evolving into Stafford's Tavern, Cove Cornice House, and Naylor's Hotel (that specialized in oyster dishes). By the 20th century, it had become a market for wholesale chickens. Independence National Historic Park requires you to obtain free tickets at Independence Visitor Center - located at 6th and Market Streets - in order to visit our next two stops - the Todd House and Bishop White House. Since you also need free tickets for Independence Hall, while you're there at Independence Visitor Center, pick up tickets for the joint Todd House and Bishop White House tour. The combined tour of both houses takes about an hour - but each tour is limited to 10 people, so try to get there early. Regardless of whether you take the formal tour, you can further enjoy your visit, by taking the Todd House Audio Tour offered by INHP, which you can do with your cell phone. Just call 267.519.4295, and hit Prompt #25. The Todd House is located at 341 Walnut Street - the corner of 4th and Walnut Streets. It has white shutters and trim, with a white picket fence. This middle-class home was constructed in 1775, on the eve of the American Revolution, by Jonathan Dilworth, a master builder and real estate speculator, as a rental property. Dilworth rented the "neat and well-finished house" to a series of tenants, until his death. His wife then sold it to the man who was the source of its current name, a Quaker lawyer named John Todd, Jr., who lived here with his wife, Dolley Payne Todd, during the 1790s - the decade in which Philadelphia served as the national capital. Todd himself lived here from 1791-93, and practiced law out of his office on the first floor - he had 350 law volumes, a considerable number at a time when books were very expensive. Madison would eventually become the fourth President of the United States, and Dolley the First Lady. He and Dolley lived at the Todd House until 1797, when they moved to his plantation at Montpelier in Charlottesville, Virginia. The Todd House is less lavish than the Bishop White House, our next stop, and is an excellent interpretation of how slightly upper middle-class Philadelphians such as the Todds lived, during the early days of the new nation. During 1961-63, it was restored to the period of the Todds' residence in the early 1790s, and is interpreted as such. Due to the fact that the estate inventory taken after John Todd's death has survived to the present-day, it is a particularly authentic interpretation, in terms of the furnishings and objects in the house. The Bishop White House is located at 309 Walnut Street - Walnut between 3rd and 4th Streets, a few doors down from the Todd House. Its name implies that it was where Presidents George Washington and John Adams lived during their presidencies, but that is not the case. It was named after its owner, Bishop William White, a high-ranking member of the Episcopal Church. And Washington, Adams, Benjamin Franklin, and Thomas Jefferson were among his guests - Washington dined there on November 19, 1798, after leaving office. White was the rector at both St. Peter's Church, as well as Christ Church, under whose altar he is buried. He decided, logically enough, to build his house on its current location, because it was halfway between the two churches. White was also the chaplain to the Second Continental Congress and an ardent patriot - as well as chaplain to the new U.S. Senate, after independence and the U.S. Constitution was adopted. His brother-in-law was Robert Morris, the financier of the American Revolution. White constructed his home in 1787, and had the good fortune (unlike several other owners of these houses) to live an extraordinarily long life by the standards of the time. He was able to enjoy his home for nearly half a century, until he died in 1836. As we've seen, the 1793 yellow fever epidemic claimed the lives of many Philadelphians, including his neighbor down the street, John Todd, Jr. But it actually made White a more beloved figure among the citizenry. Rather than fleeing the city - as most other wealthy Philadelphians did - White stayed in the city, and carried out his mission of mercy to the victims and their families. He had a large family - although by the standards of the day, it wasn't - of five children and 11 grandchildren, all of whom enjoyed the home as well. If you'd like to leave Society Hill, and return to the Home Page of Enjoying Philadelphia, please click here.